I’m pretty much a fan of Magpul and everything they have been trying to do. They have made some very good stuff. Now they have turned their attention to the classic and undying Remington 870 Shotgun. I’m not sure if I’m on board with it. At first, I thought it looked cool… But then as I looked at it, I started thinking that the Cadillac CTS-V styling just doesn’t work on the 870. 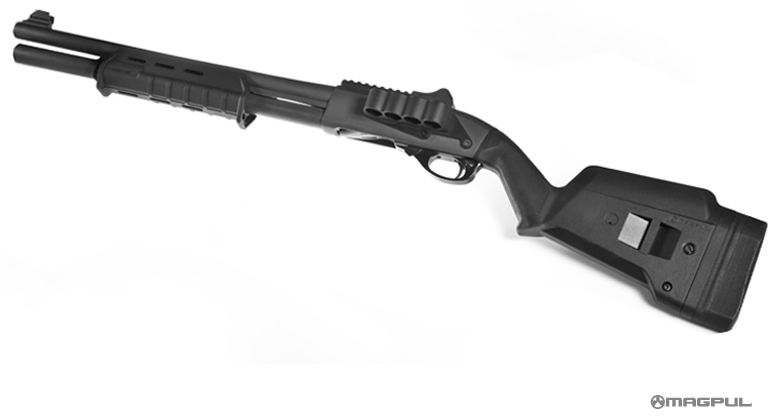 I look at the 870 and feel that it’s more organic and the Magpul stuff is just too synthetic. The stock looks like its too large and possibly heavy. Awkward. I don’t like the grip angle either. It seems… I don’t know… off. The MOE treatment is cool up front, but I would have hoped for a more CTR set up at the buttstock instead of what they got going on. Previous PostPowerNext PostMerry Christmas, everyone. Here’s the thing with Magpul… Haley and Costa were extremely high profile at Magpul. It’s not that Haley and Costa were necessarily the end all be all at Magpul, as I’m sure there are plenty of talented people still running things over there. But, with them gone Magpul’s customer base will thin a little. And with their customer based thinning and the bottom line dipping the money guys will freak out and start doing wonky things in desperation to keep their HSLD profile up and maintain their former glory. And of course that will just end up making matters worse. This might be a preview of that, eh? Well, this is certainly a Swing and a Miss, in my opinion. The ugliness and mismatched clutter don’t bother me. The grip being set so far back from the trigger is what bothers me. If that trigger finger reach was set up for a human hand, I’d be okay with the ugliness. But that’s me. I prefer guns that are ugly and severe. It is good in any case to see more attention being paid to shotguns from any angle. I don’t know. It is ugly, BUT it looks like an attempt to create some better recoil control through a more linear transfer of the recoil energy. Something similar to the collapsible stocks but approved for states like Cali. Maybe Freedom Group knows something we don’t (in regards to impending legislation). I also would like to try it with slugs. I think the higher comb could help with long distance sighting. The adjustment options are great… I like that. But I’d have to shoot it. Merry Christmas Ogre and all the rest of you. Gods bless. I can live with that aspect. What’s that big chunk of plastic do to the balance? Nothing worse for speed than shifting the balance too far to the rear. Don’t believe me? Try shouldering a Remington 141 in a hurry to make a snap shot. Emergency boat oar… sorry tactical boat oar. Maybe MAGPUL’s designers are mad that they had to design something for an ancient manual action weapon? I think shotguns and even lever actions could use some more modern stock choices. However, this one is pretty horrible looking. I think an old-style hi-point carbine looked better.